Canada as it is too well known runs a points based system called Permanent Residence (PR) Visa Point System and it is famous the world over as Express Entry System. Run and managed on the lines of the Canada SkillSelect, under Express Entry System, four easy-to-follow economic visa programmes are available, and they are: Federal Skilled Workers Programme (FSWP), Federal Trades Workers Programme (FTWP), Canadian Experience Class (CEC), and some Provincial Nominee Programmes (PNPs). What are Canada visa requirements that we are talking about? We will cover Canada PR requirements under these sub-heads: Age Requirements, Minimum Educational Requirements, Language Ability Requirements, Minimum Work Experience Requirements, and Adaptability Requirements. Age Requirements: There is no specific bar whatsoever on your age and you may apply for a Business or Investor Visa even if you are 65+. But if you are applying for the FSWP, and if you are younger, you will naturally have an edge over those who are not young. If you are between 20 and 29, you can get the maximum Comprehensive Ranking System (CRS) points available, i.e., 100. However, if you are above 45 years, you will get no CRS points. Minimum Educational Requirements: Your education must not be less than the equivalent of the Canadian Secondary School qualification. If you have higher qualifications, then naturally you will steal a march over others even while you will be preferred, vis-à-vis those with Secondary School qualification or any other qualifications. Language Ability Requirements: You must have language proficiency in at least one of the two official languages of the country, namely, English or French. If you have skills in both, you are at an advantage. The Immigration, Refugees and Citizenship Canada (IRCC) the concerned Canadian immigration & visa organization assess English and French language ability, for immigration objects, using the Canadian Language Benchmark (CLB) arrangement. It gives a position to language ability for every of the four language abilities, to be exact, speaking, reading, writing, and listening. The CLBs range between 1 and 12, with levels 1 to 4 regarded a ‘basic’ stage of capability, 5 to 8 regarded ‘intermediate’, and between 9 and 12 regarded ‘advanced’. Minimum Work Experience Requirements: You require having not less than 1 year of full time (30 hours per week for 12 months) of work experience. Adaptability Requirements: A maximum of 10 points are available on this factor. You may get these points, if you have 1 year work experience in the Maple Leaf Country. If you have done your studies in the country for 2 years, you can get 5 points. You may get points on certain other factors also but the maximum will not cross 10 points. To ensure that you profile makes its way to the Express Entry Bank, you need to obtain not less than 67 points, out of 100 points available. Do not confuse Canada PR Point Requirements with Invitation to Apply (ITA) requirements, as the latter depends on the cut-off the Express Entry Draws conducted from time to time, usually every fortnight. You can calculate your points score through Canada Express Entry Points Calculator for Permanent Residency visa. If we talks about the documents, well to make your profile you require a passport or travel document, language test results, education credential education report, provincial nomination (in case you have it), written employment offer from a local Canadian recruiter/job-provider (in case you have it); and in case you get an ITA, you require producing police certificates, medical examination report, and evidence of funds. The Canada PR Visa fee for main candidate presently is CAD $550 (primary candidate). 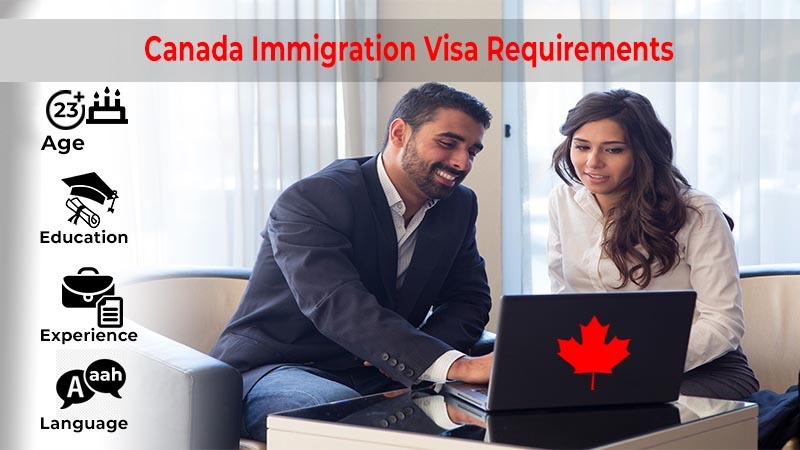 Needless to say, check with expert visa and immigration consultants for in-depth information on the mandatory Canada Immigration Visa Requirements and for also getting any kind of assistance and/or guidance on the subject. Look no further and start your journey today. Send your updated CV to us on web@abhinav.com and our experts will get in touch with you to help you with your Canada PR Visa and get you settled in Canada on Permanent Residency basis.